I was surfing through Pinterest not long ago (there’s no faster or easier way to find new recipes to try than browsing Pinterest), and I came across this recipe for healthy fudge using coconut oil. It’s probably no secret by now that I’m totally obsessed with coconut oil, so of course I was intrigued. And my coconut oil obsession has been joined by a confirmed obsession with coriander. So I thought it would be a cool idea to make the recipe “my own” by adding a hint of coriander into the mix. The end result was really tasty, and the coriander actually gave the fudge a hint of minty flavor. 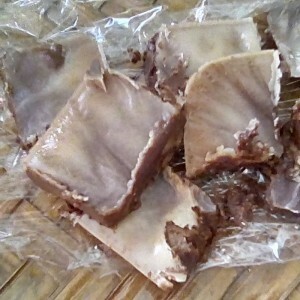 I love the simplicity of this fudge recipe, and its health benefits. It’s perfect for those who are following special diets, including paleo and gluten-free diets. This fudge is easy, delicious, and actually pretty healthy! No processed sugar – or, really, processed ANYTHING – involved. Melt coconut oil in a microwavable container for about 40 seconds, or whip it. Stir in the honey and the cocoa powder. Add the vanilla and coriander. My husband and I tried a piece each right out of the fridge, and it was very hard at the time – almost the consistency of a candy bark. After leaving it out of the fridge for 24 hours, though, this issue was easily resolved, although I found out we really didn’t want to leave the fudge out of the fridge for too long because the coconut oil and honey started melting a bit, giving the confection a slightly oily/sticky texture. But it’s not that a big a deal. You can put it back in the fridge for a few hours, and it goes right back to being yummy! I melted my coconut oil instead of whipping it because I don’t have a stand mixer, and I didn’t want to take the time out to find my electric hand mixer. Probably the texture would’ve turned out differently with whipped coconut oil. I don’t know if it would’ve tasted any better, though, because I really liked it this way. For a tutorial on how to whip coconut oil, check out this site. I’ll have to dig out my hand mixer for the next batch and try it out. I love the look of whipped coconut oil! Now I want to know: Have you tried this recipe? What did you think?